Proportionate number of births in a population, generally measured by the number per thousand of population. Since the writing of the article on Births a few additional details have been published which throw some further light on the question of the frequency of births among Jews as compared with the birth-rate in the non-Jewish population; the latter is generally lower, owing to fewer deaths in the Jewish population among children under five. For the Bulgarian Jews from 1893 to 1899 details have been published by Nossig ("Jüdische Statistik," p. 317, Berlin, 1903). The average number of births per thousand was as follows: Jews, 45.3; Greek Catholics, 44.09; Mohammedans, 28.82; Armenians, 50.00; total, 40.6. Still-births (per 1,000 births) are greater among the Jews in the following proportions: Jews, 1.8; Greek Catholics, 0.21; Mohammedans, 0.22; Armenians, 2.75. These proportions, however, are exceeded in the towns: Jews, 37; Greek Catholics, 13; Mohammedans, 18; Armenians, 19. 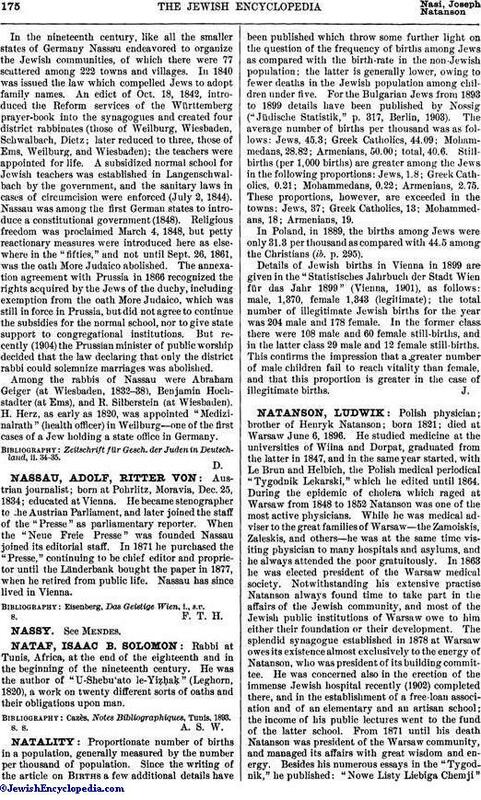 In Poland, in 1889, the births among Jews were only 31.3 per thousand as compared with 44.5 among the Christians (ib. p. 295). Details of Jewish births in Vienna in 1899 are given in the "Statistisches Jahrbuch der Stadt Wien für das Jahr 1899" (Vienna, 1901), as follows: male, 1,370, female 1,343 (legitimate); the total number of illegitimate Jewish births for the year was 204 male and 178 female. In the former class there were 108 male and 60 female still-births, and in the latter class 29 male and 12 female still-births. This confirms the impression that a greater number of male children fail to reach vitality than female, and that this proportion is greater in the case of illegitimate births.